A group of kids are trick-or-treating on Halloween and one boy decides he wants to still go to another house. This boy is Kid Ninja and he goes on his solo quest to find candy at this one last house. On his journey he meets many Halloween themed spooky foes and has to battle his way to win the candy from the last house. Join Kid Ninja in his quest for that last piece of free sugary goodness. Written by Jeremiah Wolfe and drawn by Joel Siegel. 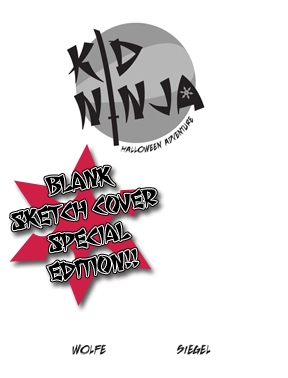 Price includes a quick sketch by Joel on the special first printing blank cover edition of Kid Ninja! !